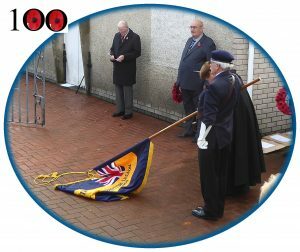 The Annual Service of Remembrance is held to commemorate all those who gave their lives serving their country. 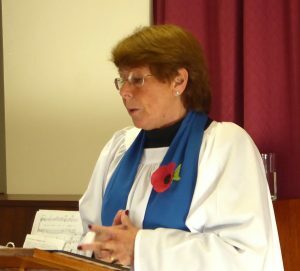 The service at Resolven was conducted by Moira Randall, the Church Warden of St David’s Church, Resolven and the Flag Bearer on behalf of the Resolven Branch of the Royal British Legion was Ashley Philbrick. 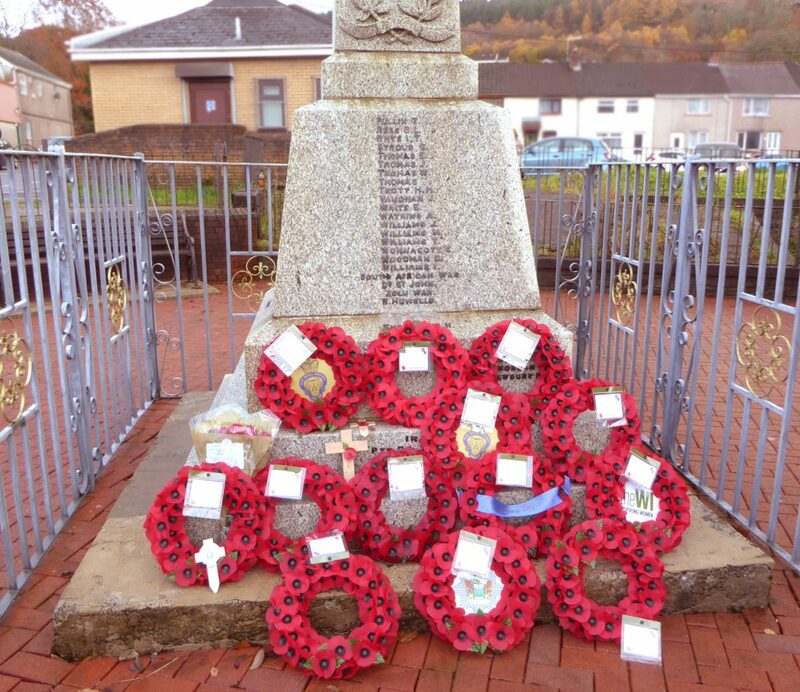 ‘The Cenotaph’ The Resolven War Memorial (one of many countless others all over the world) was built to honour and pay homage to a generation of our small village who were lost in the Great War of 1914-1918. 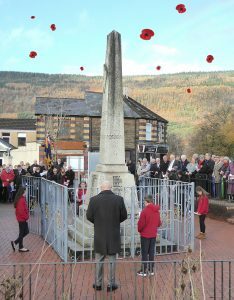 ‘The Cenotaph’ has been a familiar everyday part of the village life as far back as any living person can remember. 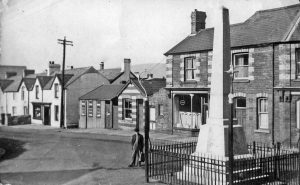 ‘The Cenotaph’ structure was erected and completed by November 1925, situated ‘pride of place’ in a prominent position on the Square, (the main hub of the village at the time), where it could be seen from Commercial Road, Neath Road, and Tan y Rhiw Road. 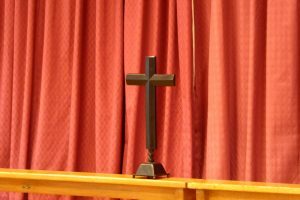 During the mid 1960’s, it was decided to moved the Cenotaph, probably due to the amount of traffic coming through the village, and relocate it to its present position, alongside the Church Hall (opened 1965). It is still very much a feature of the village. 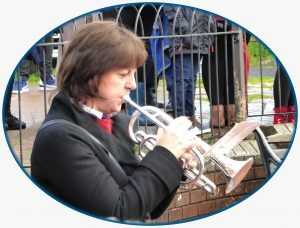 As time has gone by, sadly new names have been added to the list on ‘The Cenotaph’, all who made the ultimate sacrifice while serving their country in other conflicts of war. This has therefore, given the cenotaph a respectfully new meaning to a younger generation. 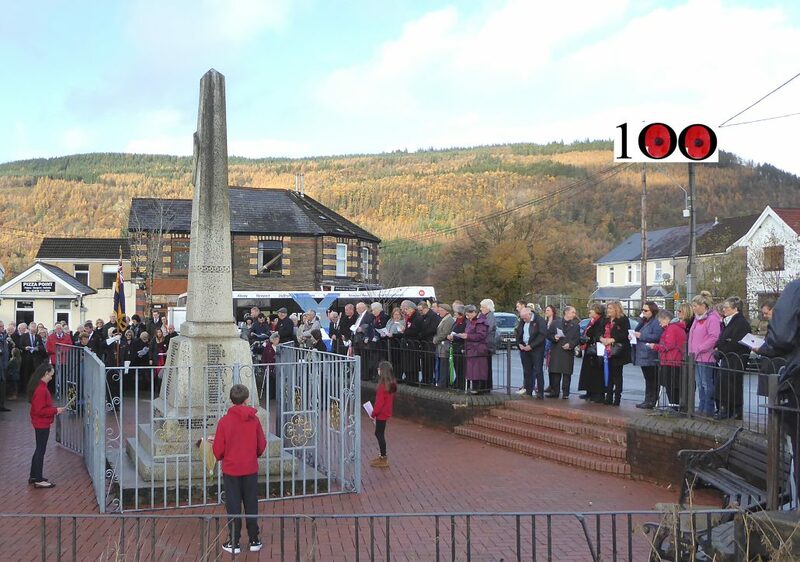 On 11th November 2018, 100 years after the end of the Great War, the large local crowd gathered around ‘The Cenotaph’, after the Service in St David’s Church Hall, to pay their respects to all those who were once part of the village community, but never returned home. Walking away after the service, watching the crowds leaving quietly it was good to remember that ‘The Cenotaph’ and its importance is a meaningful part of our history.